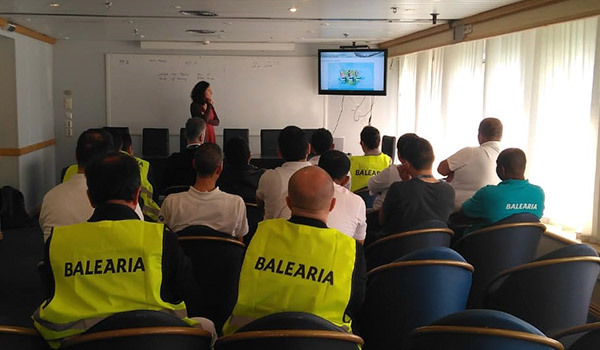 On March 20, during the training for the implementation of selective collection on the Balearia Regina Baltic ferry, Nieves Sanz from Ecoembes presented the Zero Cabin Waste Project, as an example of how to improve waste management in the field of transport of passengers. Balearia is a Spanish company dedicated to the maritime transport of passengers and goods. The company has a fleet of around 30 ships which allows to connect the Balearic Islands, Ceuta, Melilla and the Canary Islands with the Peninsula. While at the international level it also operates in Algeria, Bahamas and Morocco. Balearia is committed to caring for the environment and works to achieve the Sustainable Development Goals linked to responsible production and consumption and climate action. As part of its commitment, it has implemented measures such as the remotorization of ships to liquefied natural gas (LNG), the substitution of disposable straws for foodstuffs, as well as the replacement of common cleaning products with other ecological products, which have a lower impact on the environment. In addition, the shipping company is working on a circular economy project in which post-consumer recycled plastic could be used in the production of furniture for the decks of the ship. This last step, which allows us to close the circle, is a very interesting component to integrate in any project to improve waste management to make visible the advantages of a good waste separation at source.